While McDonald's boss rakes in £5,500 per hour, workers’ at five branches around the country have voted overwhelmingly to strike on May 1st against zero-hours contracts and poverty pay. 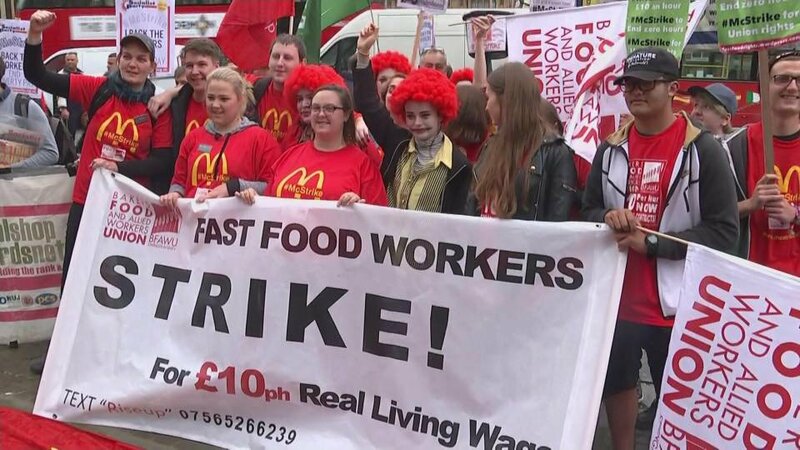 The workers, organised with the Bakers, Food and Allied Workers’ Union (BFAWU), are fighting for a pay rise to £10/hr, choice in fixed-hour contracts, an end to unequal pay for young workers and for McDonald's to formally recognise their union. While still only representing a small section of the workforce, the campaign has now spread from the two branches (in Crayford and Cambridge), which last September took the first ever official strike action at McDonald's in Britain, to three new branches in Watford and Manchester. Following the last strike, McDonald's staff received their biggest pay rise in ten years; just over 5% for all staff, with over-25s now earning between £8 and £10/hr. Meanwhile, however, McDonald's boss Steve Easterbrook got a 94% pay rise last year, adding up to £11 million annually - or about £5,500 per hour. "Money is the big issue for a lot of us" he said. "You can do a lot of hours and not see much at the end of it. People end up doing a lot of overtime. "When you mention money, you hear 'we can't afford it!' from the company but then you see his [Easterbrook's] pay, or their promotions, like the Monopoly one where they're giving away £100,000, but they say they can't afford to to pay their workers properly. It's hypocritical."